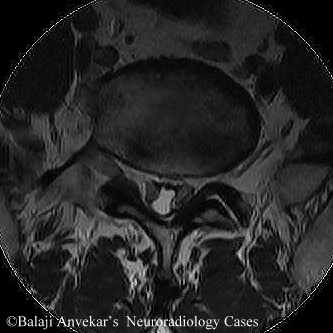 Axial T2w image at L5-S1 level show clumping of nerve roots together and adherent to the thecal sac with empty center of the thecal sac in a case with history of laminectomy in dorsal region. A broad term denotes inflammation of the spinal meninges and subarachnoid space. It develops after an acute form of arachnoiditis beginning with an inflammatory exudative reaction and progressing into fibrin deposition along nerve root sheaths and arachnoid surfaces. Collagenous strands then develop, adhering nerve roots and septating the subarachnoid space. Varies etiologies categorised into infectious, non infectious inflammation and neoplastic. Infectious includes bacterial, viral, fungal, and parasitic agents. Noninfectious inflammatory etiologies include surgery, intrathecal hemorrhage, administration of intra thecal myelographic contrast, anesthetics and steroids. Neoplastic includes the haematogenous spread or direct seeding from primary CNS tumors. Imaging wise arachnoiditis is diagnosed when multiple nerve roots are adherent to the margins of the thecal sac (Empty sac sign) or clumped together across multiple segments (Pseudotethering). Normally on axial sections nerve roots in thecal sac should fall freely in the dependent portions. The lack of normal "fanning" on sagittal views indicates an abnormal position of nerve roots within the sac due to segmental nerve root adherence. Strands of scar can loculate the CSF, creating intradural cysts or a bizarre appearance to the sac. There is may be an associated thickening of nerve roots. The thickened nerve roots of adhesive arachnoiditis do not substantially enhance. If there is significant enhancement, other causes such as CSF metastases, Guillan-Barre syndrome, and active granulomatous infection should be considered. References: Arachnoiditis, MRI Web Clinic, July 2007 by Larry B. Poe, M.D. The Elder Scrolls IV: Oblivion to the Playstation 3.
always i used to read smaller articles that alseo clear their motive, andd that iis apso happening with this piece of writing which I am reading at this place. Quality articles or reviews is the secret to invite the viewers to viksit the web page, that's what this website is providing. visit this webpage, Keep up the gоod job. first health restaurants that started catering to the smoothie demand. The first two days going without food were totally painful. Yacon tastes sweet without raising blood sugar levels, because it contains a form of sugar that is not absorbed in the body. Wonderful post! We are linking to this parrticularly great article on our website.